In addition to the latest developments of our Car Tranporter (Range Eurolohr 2.53 New, Eurolohr 3.53 New, new TALE, new Maxilohr…), we are pleased to introduce you to the new myLohr portal. Furthermore, you will also get a chance to test our Automated loading optimiser and discover our new AXle Electric Assist Lohr. Safety, versatility and outstanding performance. 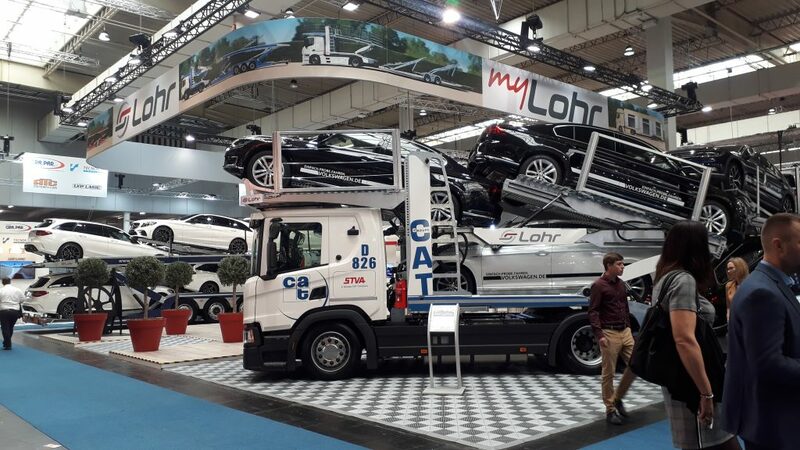 LOHR Automotive offers and expands its range of products which combine all the latest innovations and meets in broadest possible way the needs, of different fields of vehicle transport activity. SRTC Range: a brand new range of semi-trailers dedicated to High and Heavy transport. MULTILOHR/CHR Range: Providing a “traditional” solution for all requirements of mixed loads. Perfect link between light and heavy vehicles transportation. MAXILOHR Range: Dedicated to all types of heavy vehicles transportation, new trailers, extended modularity. SHR Confidential Range: new trailer for fully enclosed transport with hydraulic liftable roof and hatch. TALE: dedicated for all caravans, campers and mixed loads. myLohr: your Digital Operation Dashboard. For more than 50 years, the French family-run LOHR Group is a global specialist in the design, manufacturing and marketing of transport systems for goods and people and generates 80% of its turnover through export. Today, with a global manufacturing footprint, with 7 plants across 3 continents, 2,000 employees and a research and development centre with 120 engineers and technicians, LOHR continues to assert its position as a world leader in car transporters, to develop its road-railway activity and to develop projects for sustainable mobility. Come and discover our solutions for your operation at the IAA exhibition in Hannover from September 19st to September 27th, 2018. We will be glad to welcome you on our stand: Hall 24 Booth A06. Come and check our brand new Eurolohr 2.53 WXS and new Eurolohr 300 as our new Confifi dential SHR and TALE 2.32E displayed on our outdoor stand FG D42 – FG D44.